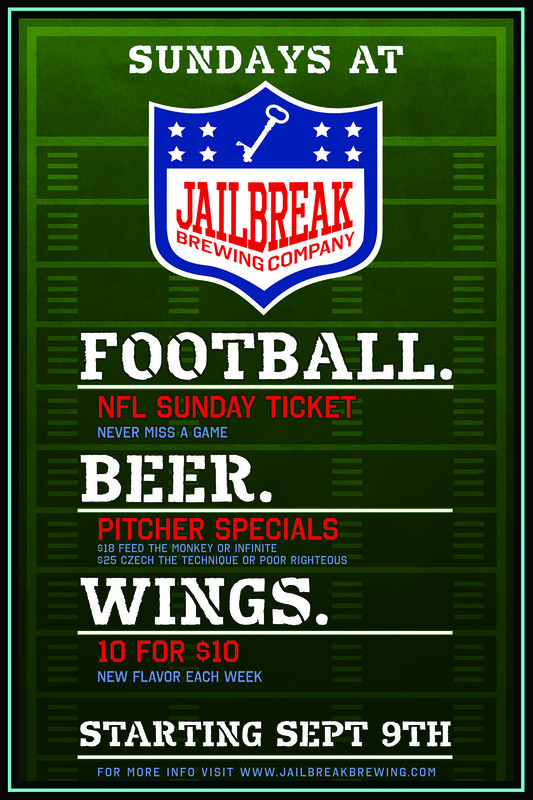 Sundays just got better at Jailbreak. That’s right—we have the NFL ticket! That means, starting Sunday, September 9th, we’ll have football, beer pitchers, and $10 wings. You can snag $18 pitchers of Feed the Monkey and The Infinite or $25 pitchers of Czech the Technique and Poor Righteous. We’ll also have a new flavor of wings each week! You can get 10 of ’em for $10. PLUS a pint + wings combo for $12 on your first order and $15 any time after that. We’ll also be serving up several different large-format feasts fit for two people, but scalable to accommodate four. Marinated in citrus and rosemary and roasted whole, then cut. Accompaniments: house-made BBQ sauce, Parisian whole grain mustard gnocchi, roasted peppers and onions, and Jailbreak mac & cheese. Slow grilled whole chicken steamed on the inside with Jailbreak canned beer, and rubbed with a light house-made dry spice and butter. Accompaniments: stewed late harvest corn and tomatoes, cast-iron Jalapeño and white cheddar cornbread with honey butter, and brown butter and blue cheese wilted spinach. And to help prep for watching those Sunday night and Monday night games at home, we’re offering 3-for-$30 crowlers ALL DAY Sunday! FYI—we’ll be staying open late for the Ravens vs. Steelers game on 9/30.